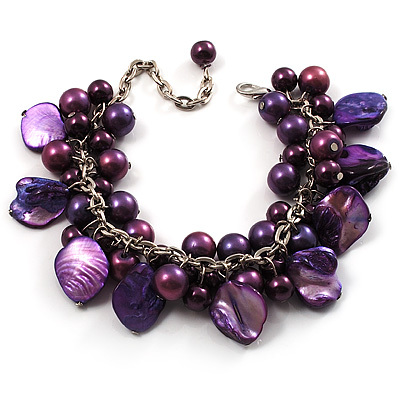 Brighten up your look with this pretty Deep Purple Pearl Bead & Shell Charm Bracelet. Featuring a charm design, made of shell bits, pearl and acrylic beads connected to a silver tone oval link chain. The bracelet measures about 15cm secures with an adjustable lobster claw clasp (about 7cm extender). Wear with silk ruffle blouses or a cute dresses. This charm bracelet can be twinned with the matching necklace to create a delightful combined set.